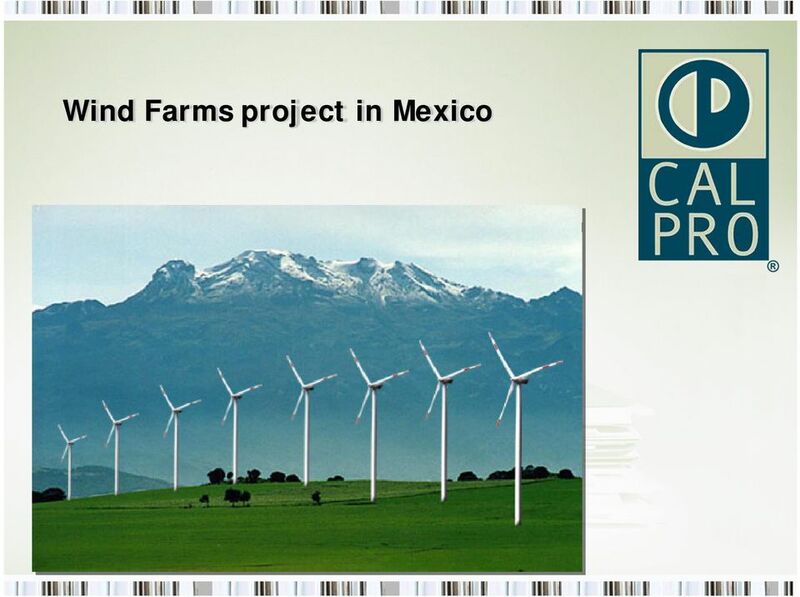 Download "Wind Farms project in Mexico"
3 Background Imperative need in fighting the weather chainging. 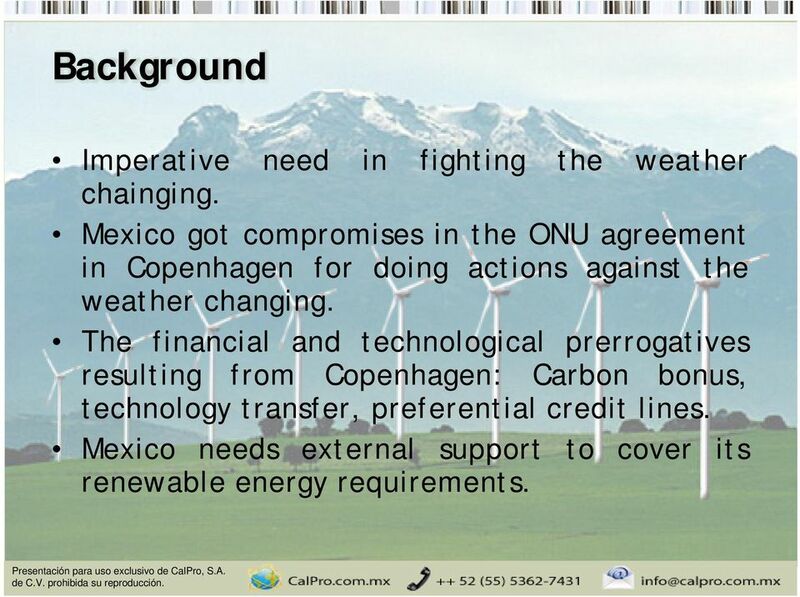 Mexico got compromises in the ONU agreement in Copenhagen for doing actions against the weather changing. The financial and technological prerrogatives resulting from Copenhagen: Carbon bonus, technology transfer, preferential credit lines. 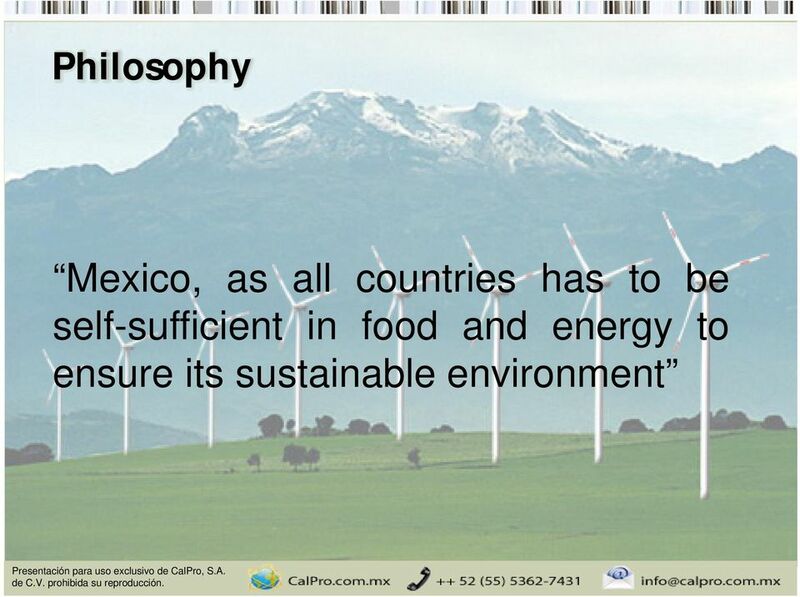 Mexico needs external support to cover its renewable energy requirements. 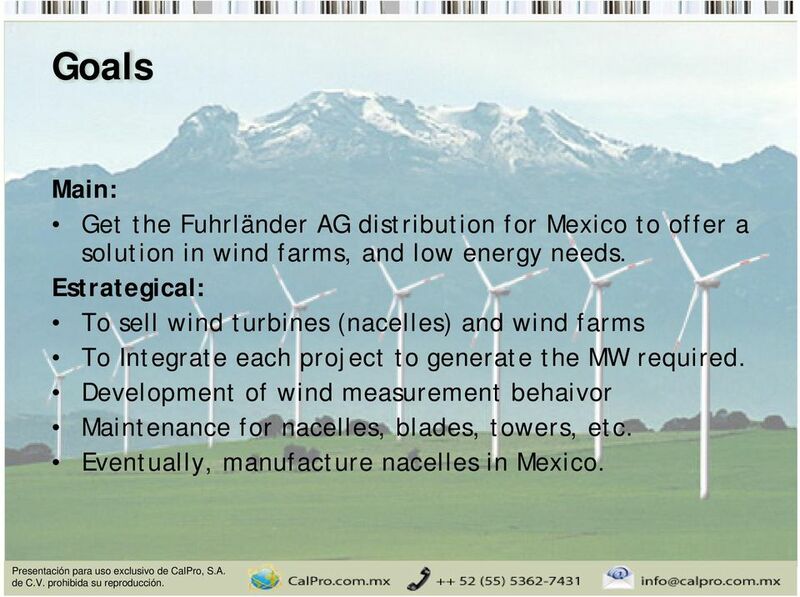 4 Goals Main: Get the Fuhrländer AG distribution for Mexico to offer a solution in wind farms, and low energy needs. 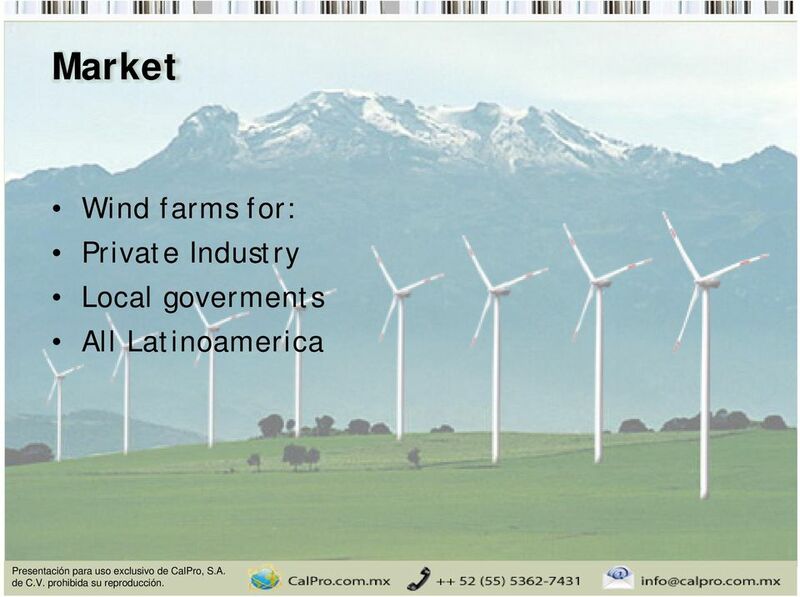 Estrategical: To sell wind turbines (nacelles) and wind farms To Integrate each project to generate the MW required. Development of wind measurement behaivor Maintenance for nacelles, blades, towers, etc. Eventually, manufacture nacelles in Mexico. 8 Capacitación IngenieríadeSistemasdeGeneraciónRenovablesysu integración en el Sistema Eléctrico Impartido por el Dr. Gustavo Quiñonez de la empresa española ACCIONA ENERGY. 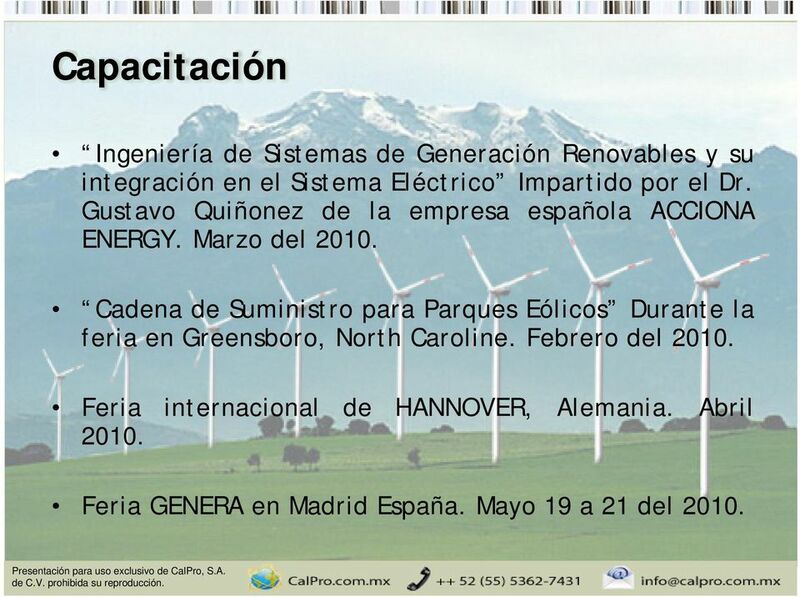 Marzo del Cadena de Suministro para Parques Eólicos Durante la feria en Greensboro, North Caroline. Febrero del Feria internacional de HANNOVER, Alemania. Abril Feria GENERA en Madrid España. Mayo 19 a 21 del 2010. 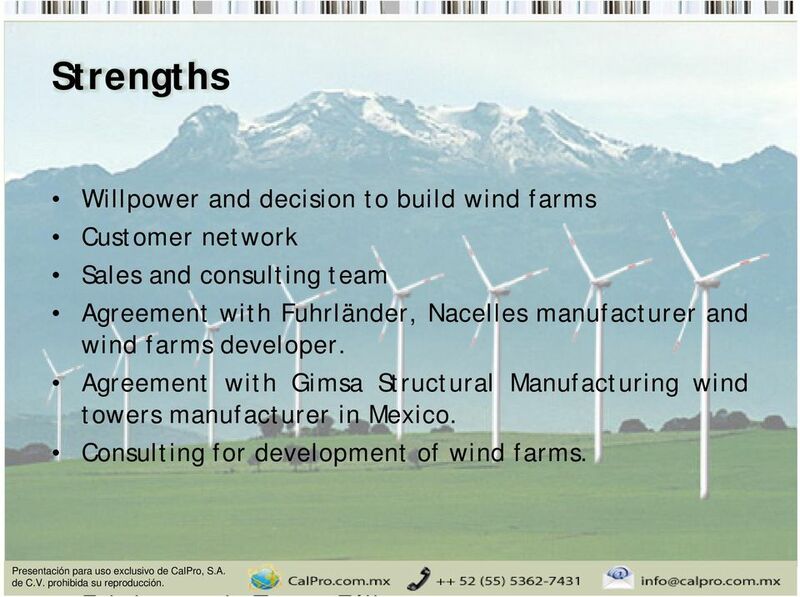 10 Strengths Willpower and decision to build wind farms Customer network Sales and consulting team Agreement with Fuhrländer, Nacelles manufacturer and wind farms developer. 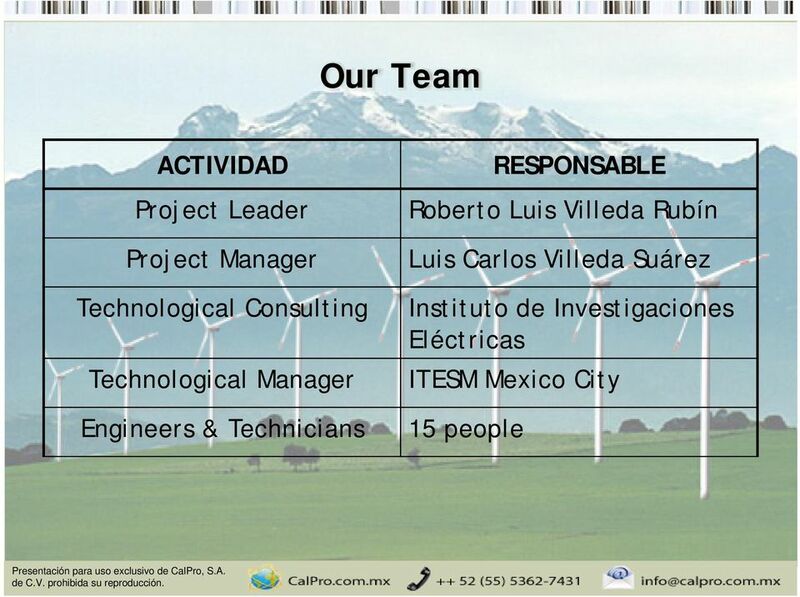 Agreement with Gimsa Structural Manufacturing wind towers manufacturer in Mexico. 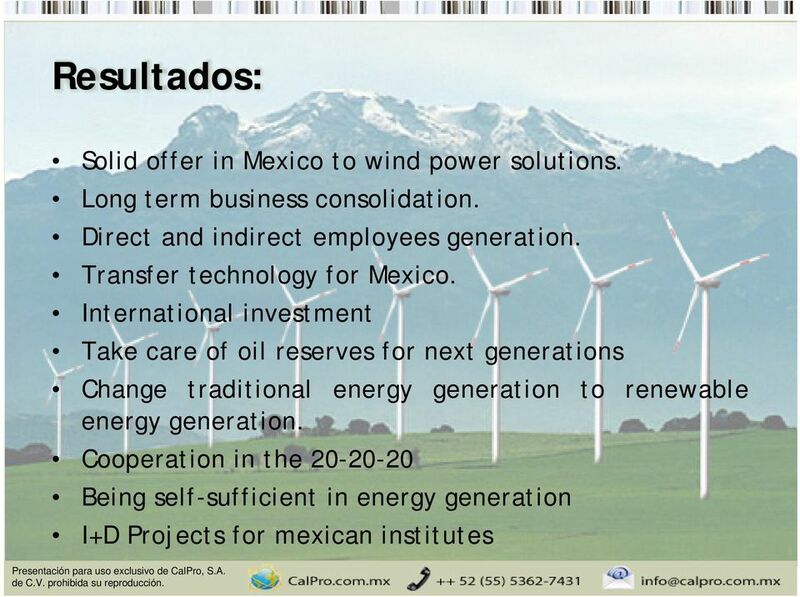 Consulting for development of wind farms. 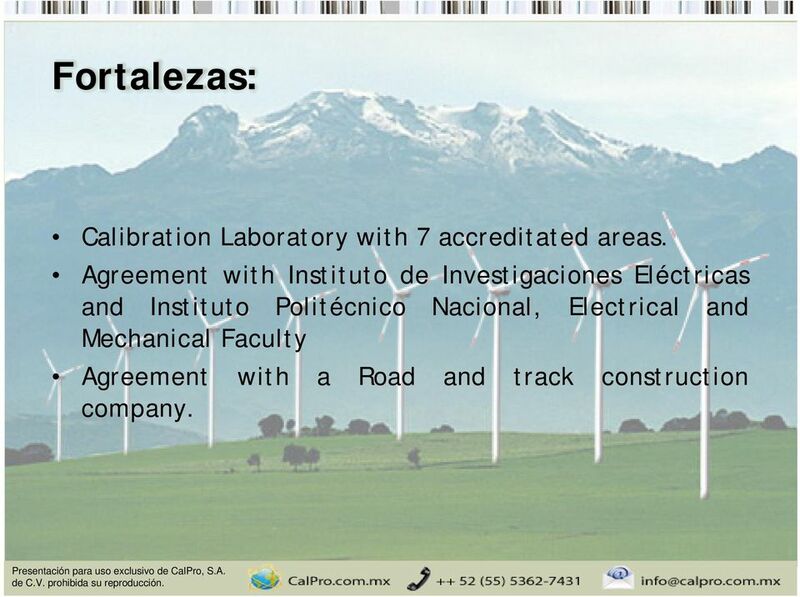 11 Fortalezas: Calibration Laboratory with 7 accreditated areas. Agreement with Instituto de Investigaciones Eléctricas and Instituto Politécnico Nacional, Electrical and Mechanical Faculty Agreement with a Road and track construction company. 12 Weakness: We have not low rate credits yet We are searching for it We have not technological transfer for manufacture in Mexico Nacelles yet. 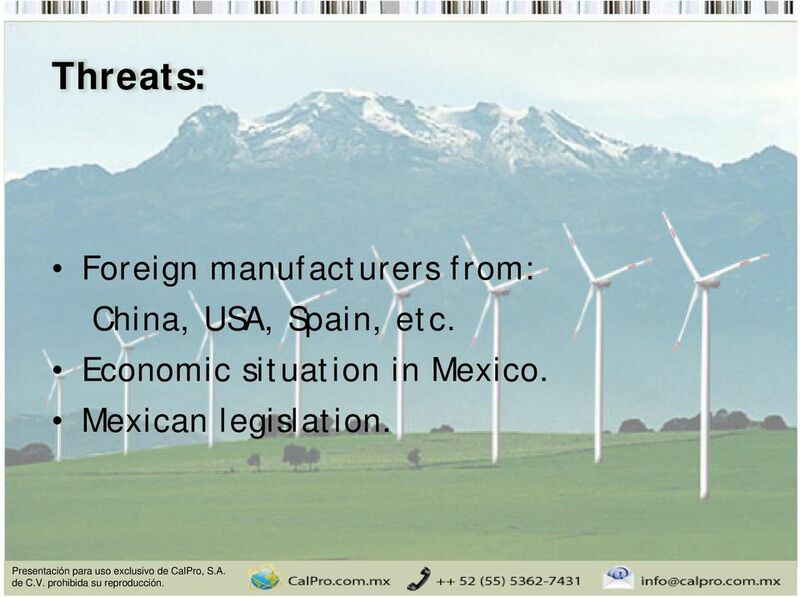 13 Threats: Foreign manufacturers from: China, USA, Spain, etc. Economic situation in Mexico. Mexican legislation. 14 Opportunities: Huge market; Mexico as well as Latinoamerica. Comitments for complying with Copenhaghen Summit agreements. 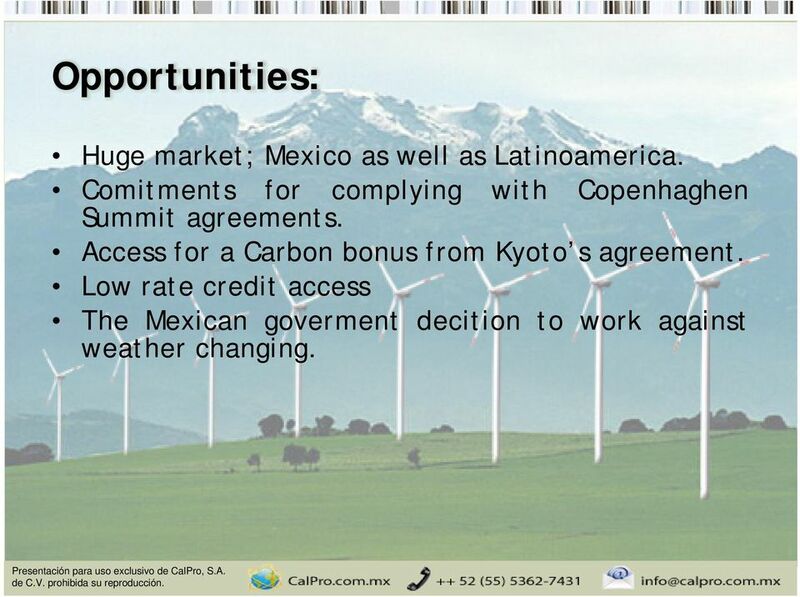 Access for a Carbon bonus from Kyoto s agreement. 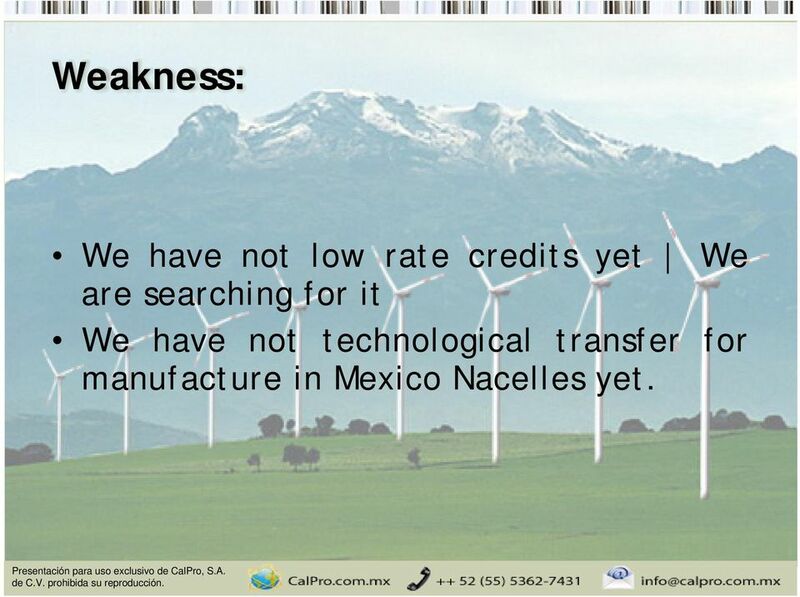 Low rate credit access The Mexican goverment decition to work against weather changing. 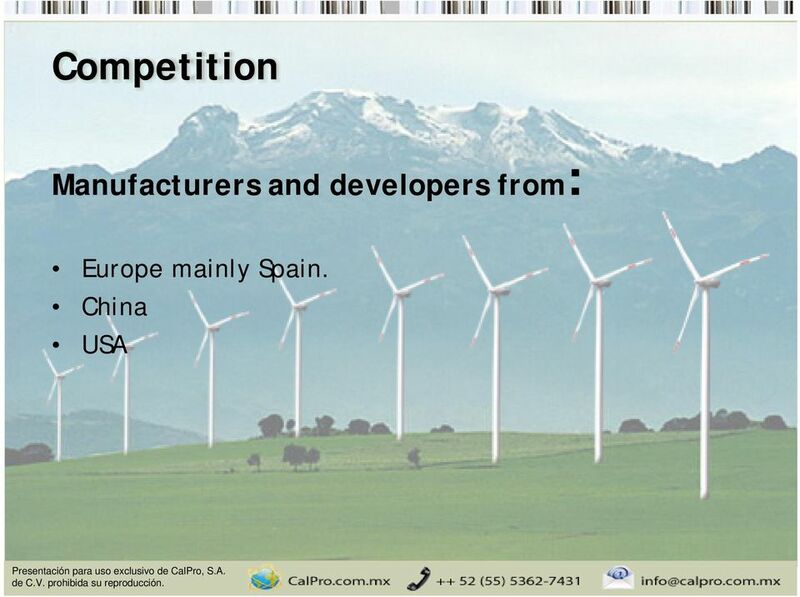 15 Oportunidades: UE support to Latinamerican companies. 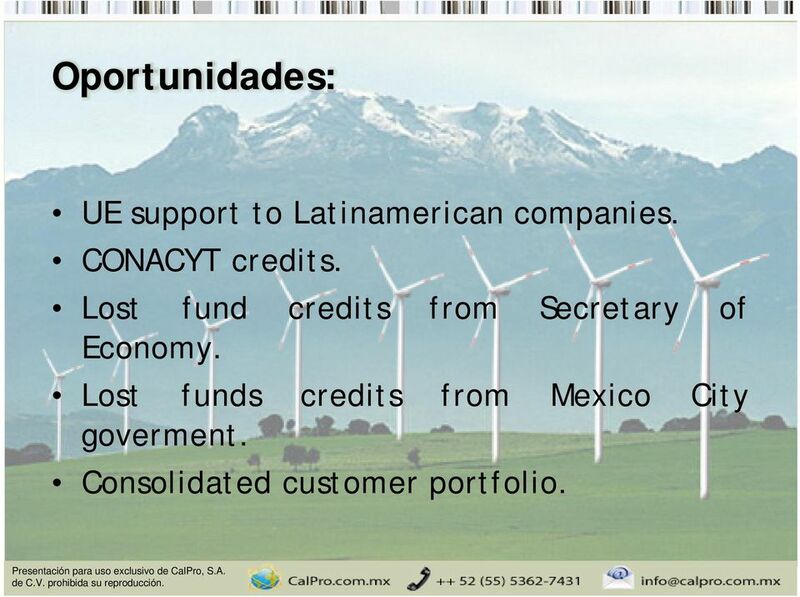 CONACYT credits. Lost fund credits from Secretary of Economy. Lost funds credits from Mexico City goverment. Consolidated customer portfolio. 18 What are we looking for? 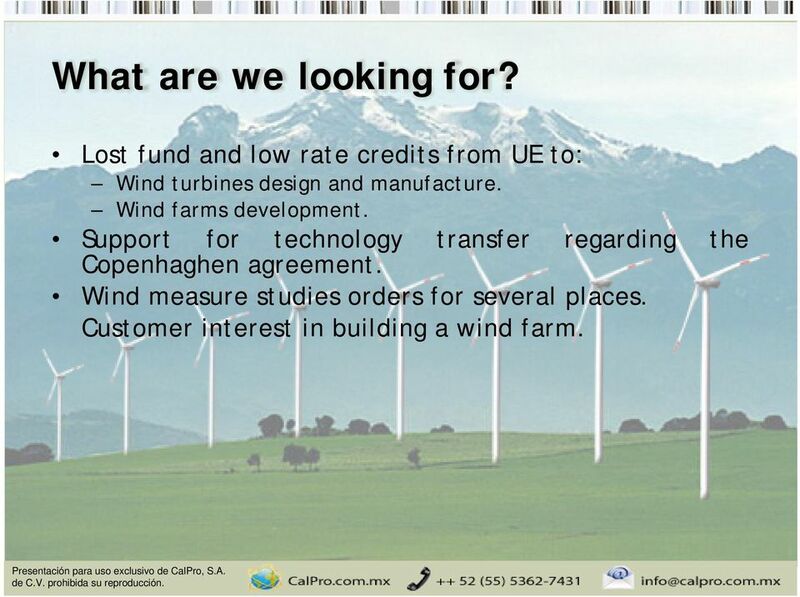 Lost fund and low rate credits from UE to: Wind turbines design and manufacture. Wind farms development. Support for technology Copenhaghen agreement. 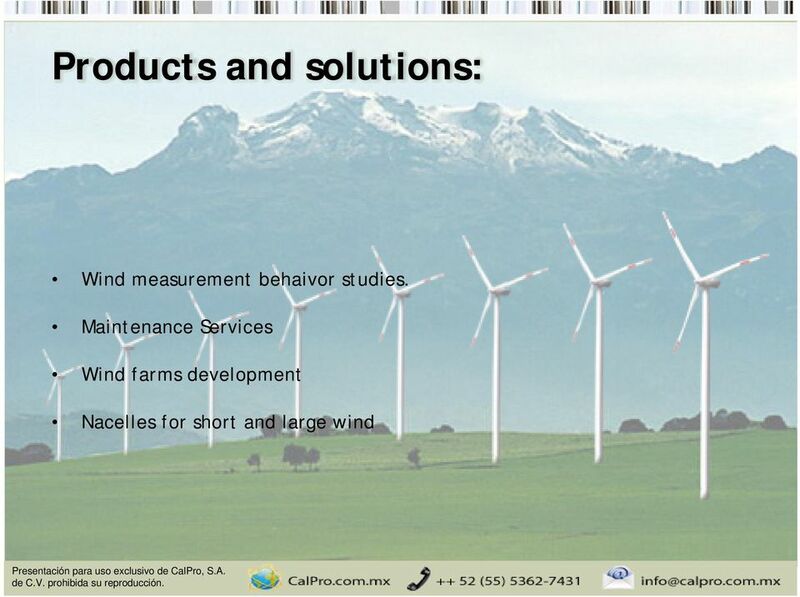 transfer regarding the Wind measure studies orders for several places. Customer interest in building a wind farm. genera Jornada de Encuentros Bilaterales para la Transferencia de Tecnología en Energía Technological Brokerage Event in Energy www.madrimasd. Innovando en sistemas oleohidráulicos. Innovating in fluid power technology. CLOUD COMPUTING AS A FACILITATOR TOOL FOR THE ENTREPENEURSHIP IN COLOMBIA. Carlos Andrés Osorio Toro Teacher Researcher CESA carloso@mail.cesa.edu. Overview April 2009 OVERVIEW Financial company specialized on sustainable infrastructure investments Over 12 years of successful originating, underwriting, managing and monetization of financing assets. QUIERES SER UN KIN PARTNER? WOULD YOU LIKE TO BE A KIN PARTNER? RFID TEMPERATURE SENSOR. Autor: Polo Tascón, David. Director: Kramer, Kathleen. Entidad colaboradora: Advantageous Systems LLC. POR QUÉ ROOM PROJECT ES UNA SOLUCIÓN FIABLE? POR QUÉ ROOM PROJECT ES UNA SOLUCIÓN FIABLE? WHY IS ROOM PROJECT THE BEST RELIABLE SOLUTION TO YOUR MANAGEMENT PROBLEMS? Y porque... And also because Compartimos los riesgos. 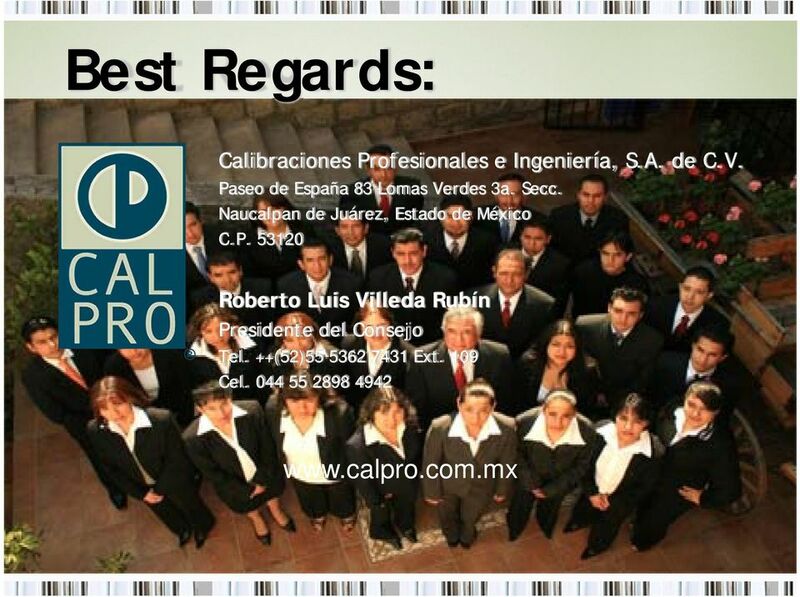 Servicios en outsourcing. Cómo participar? Juan Cristóbal García jgarcia@zabala.es ZABALA Innovation Consulting El contexto Compromisos Action Clusters Web Cómo participar? 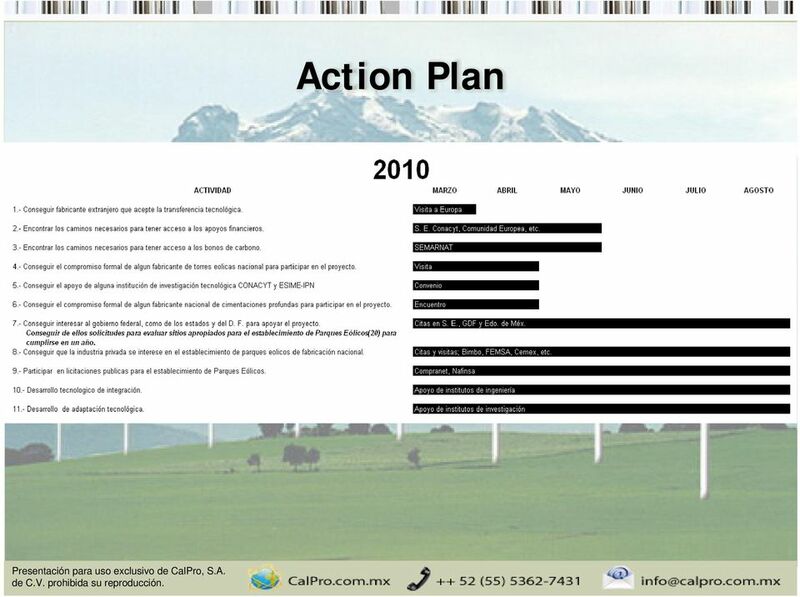 El contexto Compromisos Action Clusters Web Cómo participar? Área de Plásticos. Dedicada a su vez a labores de Investigación y Desarrollo en dos grandes campos: Transformación de plástico y pulverización.